This article examines s 281 of the Mineral Resources Act 1989 (Qld) and the way that section has been interpreted in the context of assessing compensation for landowners affected by the grant of a mining lease over their land. Section 281 of the Mineral Resources Act 1989 (Qld) is unique in that the heads of compensation as interpreted by the Queensland Courts are focussed on permitting a land owner to recover losses peculiar to the owner. The focus is not on the “loss” of the land but of diminution of its value (both market and non-market based) to the landowner. 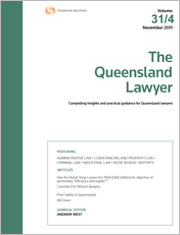 The full article can be accessed here: “An examination of the heads of compensation available under the Mineral Resources Act 1989 (Qld)” (2010) 30 Qld Lawyer 71. * Associate Professor Kristy Richardson, School of Commerce and Law, Faculty of Arts Business Informatics and Education, CQ University Australia, Rockhampton and Mr John Compton CPV, FAPI.